Made in a cauldron according to tradition, as does its ancestor, the authentic cube from Marseille, this liquid soap is elaborated with vegetable oils from Provence. This soap gently cleanses the skin. Presented in a glass pump bottle with a sleek and colorful design, it will look great in your kitchen or bathroom, and can be refilled with the corresponding refill bottle. 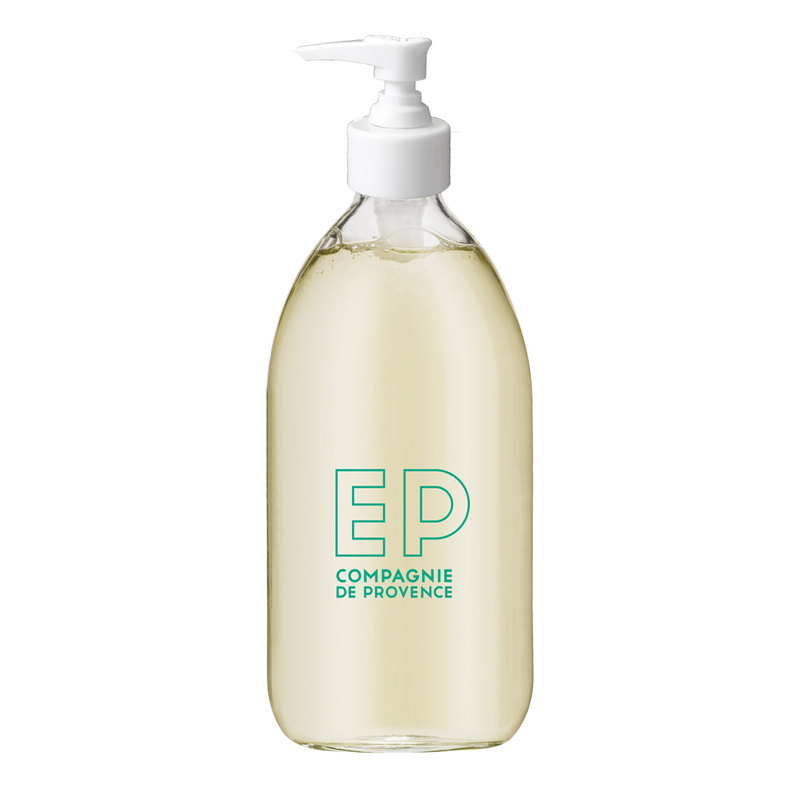 The iconic design on the glass bottles is often spotted in home decor design photos, showing the sleek Savon Liquide Marseille Extra Pur on one side and EP Compagnie de Provence on the other (EP for Extra Pur - which it is!). Aqua (Water), Potassium Cocoate, Glycerin, Parfum (Fragrance), Hydroxyethylcellulose, Polyglyceryl-3 Caprylate, Tetrasodium Glutamate Diacetate, Benzyl Salicylate, Cocos Nucifera (Coconut) Oil, Potassium Olivate, Prunus Amygdalus Dulcis (Sweet Almond) Oil, Vitis Vinifera (Grape) Seed Oil, Helianthus Annuus (Sunflower) Seed Oil, Tocopherol, Olea Europaea (Olive) Fruit Oil. Keep one near every sink! Still made in a cauldron according to longtime tradition, this legendary Marseille soap is made with vegetable oils and naturally glycerined. Biodegradable, it's guaranteed free of artificial coloring and animal fats. Love the liquid soap and the fact that it came with a safety seal for shipping. Best soap on the market in my opinion! Have been purchasing it for at least five years; often give it as gifts as well. Merchant Response:We tend to agree - thank you! ConsNeed to clean dispenser ends frequently. One note about the packaging: The shrink-wrap plastic used to keep the product from leaking also deforms the soap pumper, forcing the plastic pumper into a downward-facing position. An unintended consequence is that the pumper then forever drips, especially immediately after one has used the product. My husband and I love the fragrance of this soap. It's not too feminine and very pleasant. The soap cleans without drying your skin. The bottle is gorgeous as well. Moisturizer definitely doesn't dry and vegan!!! I love it's smell so nice and make me feel so clean while my dry skin become moisture! I've used the orange scented Savon de Marseille soap before, and I really liked it. But I love the smell of violets so I was thrilled to find their violet scented soap on Vickery! 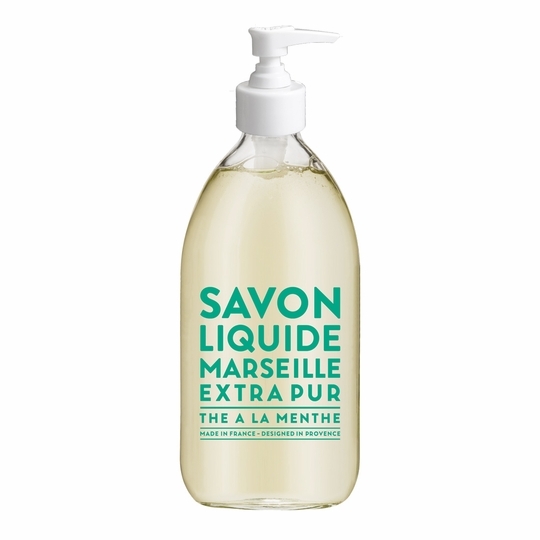 In fact, Savon de Marseilles soap is the only one my very picky daughter will use in her home. I've been using Savon de Marseille for years. It washes away clean; doesn't leave any sort of residue on my hands. The scents are fantastic, and the packaging is gorgeous. ProsGreat soap. Great scents. Great packaging. Excellent produce and good timeline for delivery. I have bought 4 different scents. In the end, not only myself but other men who have tried the Fig prefer it over the others. My wife liked the orange blossom in the kitchen, but in my opinion, the Fig is the best scent. This hand soap has a noticeably smoother texture to it than cheap grocery store soap. One squirt will suffice, so it lasts a while. The Fig scent remains well after washing your hands and it has a very unique scent. My buddy liked the Fig so much, he asked me for a bottle for Christmas. Prosfantastic odor that lasts for a nice long time. extremely smooth texture. one squirt will be enough.